In honor of Mental Health Awareness Month, I just read a fantastic book, Toppling the Idol of Ideal. This great book deals with children with hidden disabilities. I don’t even have children, but I stayed riveted by this book and learned so much, making me a better friend and lay counselor. 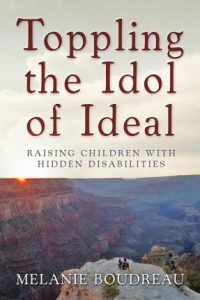 Toppling the Idol of Ideal by author Melanie Boudreau was written for parents raising children with hidden disabilities and those who love them, especially leaders who are active in ministry and desire to address needs with sensitivity and wisdom. Hidden disabilities cover diagnoses that include ADHD, autism, and mental health conditions. Each are prevalent in society and yet taboo to admit openly in the church. Uninformed opinions from pulpits to the pews can damage and alienate the most vulnerable. 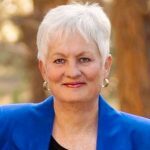 This book offers a rare view of both practical and spiritual insights to help families and ministers alike navigate the misperceptions that accompany special needs which are often invisible to the eye. If you have a child with a hidden disability, or know someone with a child with a hidden disability, please treat yourself to this very good book. It will inform as well as delight. I guarantee it. Connect with Melanie Boudreau on Facebook here. Read her blog posts here.